I arrived at Piante in Old Town to interview Sonya Fe about her upcoming exhibit just as the artist was unloading her paintings from her van, and several pieces were already leaning up against the walls on the gallery floorboards, filling the space with lush, translucent color. Even though the room was full, Sonya, dressed for warmer weather in petal pushers splashed with a tropical print, sandals, and a spaghetti-strap blouse, kept hauling in more work. "I didn't want you guys to have to call me out in Hoopa to bring in more stuff," she told Sue Natzler and Jo Cunningham, the gallery's owners. The oil and wax paintings, as flamboyant as the painter herself, spilled over into the other rooms. 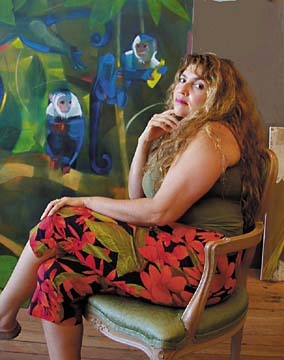 I had been reading up on the internationally recognized Mexican-American artist prior to our visit and had discovered that at 52, Sonya has built an impressive resume, with exhibition credits as far away as Japan. She has also generated a lot of media coverage, much of it focusing on her East Los Angeles "ghetto" background and crediting Sonya's creative tenacity with her transformation from impoverished child to renowned California artist. Sonya laughed when I asked if she was really raised in a ghetto. "I'm trying to get away from that whole image," she said, insisting she loved growing up in "Dogtown," the housing project resting in the shadow of the L.A. County Jail. "Plus, `ghetto' is a term that doesn't exactly fit L.A. -- that's more of a New York thing, isn't it?" Sonya describes her childhood as a very happy one in spite of her poor neighborhood, with strong parental and community support for her art from an early age. "I go back now and wish I could still live there. Sometimes it was predominantly black, sometimes Hispanic, it took turns, but I loved it -- the people were unique. That environment allowed me to develop my art and a sense of humor." I remembered from Sonya's resume that she had been awarded a summer scholarship to Otis Art Institute in Los Angeles when she was just 13 years old. "My teacher was Alan Zaslove and I thought he was so daring because he said the word `damn' in class," Sonya recalled. She went on to get a first-rate education at the Art Center College of Design in Pasadena, but says what was lacking in her formal training was an exposure to Mexican artists. "When I went to Otis and the Art Center, the Mexican artists were never mentioned. And then, back in 1976, I went to the Mexicana Art Center in L.A. and they talked about all these artists -- Siqueiros, Orozco, Diego and Frida -- and I had never even heard of them." After receiving payment for a mural commissioned by Pacific Telephone, Sonya took a trip to Mexico the see the art firsthand. "It changed my whole perspective," she said. "The work was so raw and so lively, so spiritual, and when I came back my work changed. They say paint what you know, and here I was trying to paint like the New Yorkers." She laughs, shaking her head. "In L.A. It was crazy." A Mexican art influence remains strong in Sonya's work today, with her use of bold designs, simplified shapes, and flat, intense color, but she says she has had many creative influences and sources of inspiration over the years. "I get ideas when I least expect it. A while ago, when I was driving over here, I was thinking of a woman having dinner with a monkey and calling it Having Dinner with My Husband." She laughs, thinking about it. "I get ideas from everywhere." Sonya pointed out her most recent painting, When She Calls, He Comes, a large piece featuring male and female monkeys frolicking in a richly layered jungle of green and blue. "I went to Costa Rica and saw this scene, this was years ago, but I remembered it and I knew I'd get to it someday." She added that this method of painting a place long after she's left it behind is common for her. "When I lived in the desert, I didn't paint the desert -- I painted scenes from Ventura County, where I lived before. When I moved to Sacramento, then I painted the desert. Now that I'm in Hoopa, I'm not painting Hoopa; I'm painting Sacramento and the desert. That always happens to me. I have to work the place into my system first, I have to live it, then think about it, then later I start painting it. It takes time." The work included in the Piante show represents a retrospective look at Sonya's career, with subject matter featuring women, children and animals in a wide array of settings. "I paint women because that's what I know, and I understand situations that happen to them -- and when I paint children, I don't want to paint them too cutesy, I want to paint them with respect, as little human beings. I have to put human figures in my work. That's how I make contact." Sonya Fe's show will continue at Piante through July with an opening reception during Arts Alive! on July 3. Three new exhibits open at the Graves this weekend, including Rebecca Murtaugh's multimedia installation, "The Termination of the Production of Writing," a definite "must-see" show. There'll be a presentation by the artist on July 2 at 7 pm. "Young Alumni," an exhibition featuring new works by 14 alumni art majors from HSU, opens at the First Street Gallery in Old Town. In case you weren't aware of it, Eureka's cultural sister city is Nelson, New Zealand, and in July three local venues will feature the work of Nelson artists: New Zealand mask-maker Kim Merry will exhibit in the Annex Gallery at The Ink People; painter Sally Papps will show her work at Gallery Dog; and the Graves will present "Native Woods of New Zealand," featuring the work of master woodworkers Ann & Bob Phillips and Tim Wraight (with an artist's presentation on July 11, at 3 pm). A limited edition replica of The Ring used in the Lord of the Rings trilogy, designed by Nelson jeweler Jens Hansen, will also be on exhibit at the Graves.